Congratulations to Brian McCarthy, Bruree Co Limerick on finishing in 3rd place in this year’s National Finals Community Games Cycling Championship in Athlone in U12 cycling. 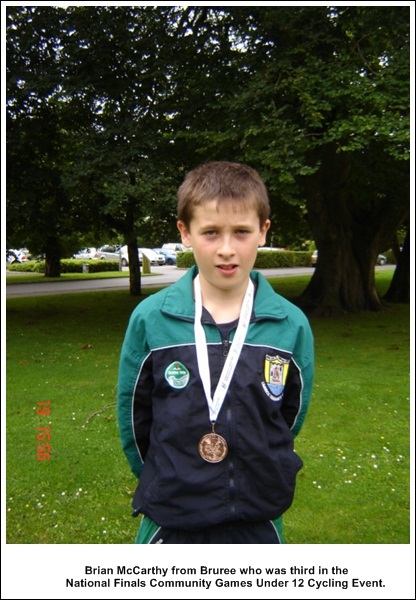 Brian was racing against Donegal, Tipperary, Sligo, Mayo, Clare, Kerry & Cork in the final. Wheely well done Brian, all in Southside Wheely Wheelers cycling club are very very proud of you. Well done Brian. Senior A3 Road Race Championship in Blackrock, Co. Louth (Sunday) Daithi Creedon of Southside Wheely Wheelers did our cycling club proud by cycling against Ireland’s best cyclists and finished in the bunch and had a fantastic race finishing 22nd in his first Irish Championship. Again our club are very proud of you Daithi. The 17th Annual Trip to Tipp Tour 180k and 100k last Sunday in Thurles was a challenging tour with major climbs and fast decents but a rewarding cycle to prepare for the upcoming Sean Kelly Tour next Sunday. Well done to Dave Walsh, Jimmy Lillis, Willie McCarthy and Paul Finn. 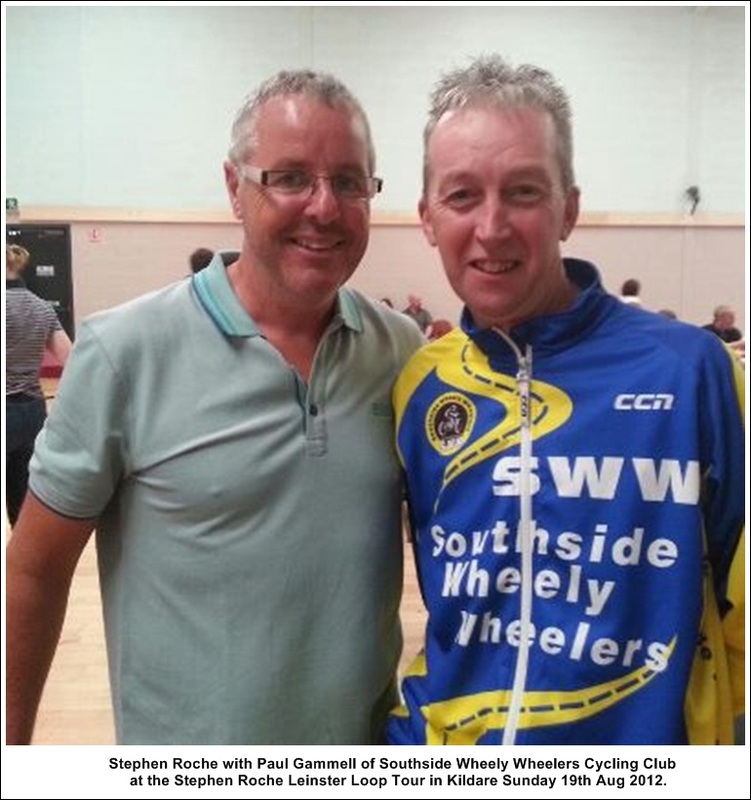 Congratulations to Paul Gammell who took part in the Stephen Roche Leinster Loop Tour in Kildare to celebrate Stephen Roche who won the Tour of Italy, the Tour de France and the World Championship in 1987. Stephen Roche is only the second man in cycling history to win the triple, the other is the great Eddy Merckx. Paul enjoyed spinning the wheels as he cycled 130k with Stephen in perfect cycling weather over a demanding tour taking in some tough climbs on very fast rolling roads. It was a day of celebration for Stephen Roche who received a very special handmade glass sculpture to mark this special historic Irish cycling achievement. Another historic occasion was the Walled Town Day celebrations in Kilmallock and this was celebrated by Southside Wheely Wheelers by cycling to another Walled Town of Buttevant and back to Kilmallock. The cyclists left Kilmallock at 9.15pm last Sunday and were welcomed in Buttevant by a full choir in full song followed by food and refreshments. Our club would like to thank both Kilmallock and Buttevant Wall Town committee for such a great day of cycling and our cycling club would like to thank our club cyclists for taking part in this historic event. Our club cyclists have cycled with the greatest Irish cyclists over the last two weeks, Martin Earley, Stephen Roche and now is our chance to cycle with the great Sean Kelly in the Sean Kelly Tour of Waterford in Dungarvan this Sunday. Distance: 160km, 90km, 50km. Time: 160km-8:30am. 90km – 9:30am. 50km – 10:30am. Weekly Training: Saturday at 9.30am. Sunday at 8.30am and Wednesday at 6.30pm all meet at the car park next to Kilmallock Cycles. All new cyclists are very welcome to join us enjoying cycling and are always very welcome to join our cycling club. Martin Earley Tour of Kildare and the Vee Challenge. Last Sunday Southside Wheely Wheelers club cyclists took part in the Vee Challenge 130km and 90km cycle from Youghal climbing over the Vee Mountain, a challenging cycle from the sea to the mountains. Cycling the ascent of the Vee from Lismore and fast descending was the order of the day over some challenging climbs making this tour a wheely tough but rewarding cycle. Well done to Liz Leonard, Dave Walsh, Jimmy Lillis, Willie McCarthy and Martin Lake. Wheely great cycling. SWW club cyclists also took part in last Sundays Martin Earley Tour of Kildare in aid of the Marie Keating Foundation and offered Southside Wheely Wheelers cyclists the opportunity to cycle with one of Ireland’s most successful cyclists, Giro d’Italia and Tour de France stage winner Martin Earley and help a worthy charity. This year the promoters of the Tour of Kildare decided to add some demanding climbs and one called the Wall, the name speaks for its self. Well done to Pat O’Donnell, Ber Gammell, Michelle Gammell and Paul Gammell for taking on the Kildare challenge. Wednesday evening training at 6.30pm is now focused on preparing for the very enjoyable Sean Kelly Tour of Waterford on Sunday the 26th August. We had two big groups out training last Wednesday. Limerick CC are holding the National Youth Championships this year in Limerick on August 25th & 26th, and SWW are looking for the underage cycles to take part in this competition. The event will be run in the following categories, U11, U12, U13, U14, U15, & U16. So if any SWW underage cyclists are interested please contact the club or just turn up at training. Training for The Nation Youth Championships has started, and will continue for the next 2 weeks on the following nights, Friday 17th Monday 20th Wednesday 22nd Friday 24th. All training will start at 6.30pm, meet in car park next to Kilmallock cycles. Congratulations to Daithi Creedon who raced in the Ballinrobe 2 day in Co Mayo last weekend and also raced the previous weekend in the Suir Valley 3 day in Clonmel. 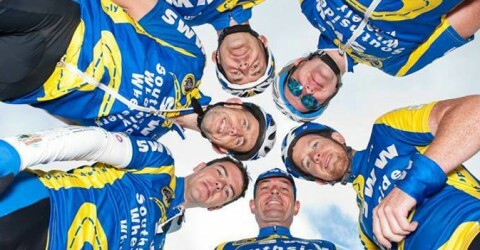 Upcoming tours are the Leinster Loop with Stephen Roche Sunday 19 Aug Old Grange, Narraghmore, Co. Kildare Distances – 130 kms/ 90 kms/ 50 kms/12 kms Times – 9.30 sharp. Trip to Tipp Sunday 19 Aug. Distance: 180km sign on 7.30am depart 9.00am 100km sign on 9.00am depart 10.30am 70km sign on 9.00am depart 10.30am 20KM Family fun cycle Sign On: 10.30am depart 11.30am. Sean Kelly Tour of Waterford Dungarvan, Distance: 160km, 90km, 50km. Time/Sign On: 160km-8:30am. 90km – 9:30am. 50km – 10:30am. If you cannot get to the tours then Sunday 19 Aug a cycle of 50k to Buttevant and back to Kilmallock has been organized by the Walled Town Day committee. Cycle starts at 9am from the car park next to Kilmallock Cycles. Food organized in Buttevant by the Town Wall committee. Weekly Training: Saturday at 9.30am. Sunday at 8.30am and Wednesday at 6.30pm all meet at the car park next to Kilmallock Cycles. All new cyclists are very welcome to join us enjoying cycling and are always very welcome to join our cycling club. For more information about our cycling club, why not click on our club website http://www.southsidewheelywheelers.com and on face book or you can also email us on southsidewheelywheelers@gmail.com. Southside Wheely Wheelers Cycling Club took on the challenge of the Tour de Kilkenny last Saturday the 4th August and all funds raised were in aid of Barretstown, a charity aimed at rebuilding lives affected by childhood cancer. The Tour de Kilkenny has the reputation of being one of the toughest cycling tours in Ireland and this year the weather made it even tougher with wild head winds and horizontal rain but our club cyclists are made of stern stuff and rode hard all day climbing over some of the highest climbs to complete the personnel achievement and well earned satisfaction of completing the 2012 Tour de Kilkenny, Congratulations to Willie McCarthy, Mike Sexton, Sam Hand, Mary McCarthy and Ber Gammell. Wheely well done. Wednesday evening training at 6.30pm is now focused on preparing for the very enjoyable Sean Kelly Tour of Waterford on Sunday the 26th August. We have three groups as everyone can cycle at their own pace to start wheely enjoying cycling. Out training for the Sean Kelly Tour of Waterford in Dungarvan were Daithi Creedon, Willie McCarthy, Owen Tobin, Jerry Ryan, Jimmy Lillis, Michelle Gammell, Sean Burchill, Garry Tierney, Mike Sexton, David Daly, Cyril Power, Jimmy McCarthy, Brian McCarthy, Paul Gammell and Jonathan Moloney. Tours over the next three weeks are the Tour of Kildare Sunday, 12 Aug 2012 Naas CC Distance: 100,50,20km Time/Sign On: Naas court hotel 100/50 10am 20km 12 midday. The VEE challenge Sunday, 12 Aug 2012. 130km and 90km The Leinster Loop with Stephen Roche Sunday 19 Aug 2012 Old Grange, Narraghmore, Co. Kildare Distances – 140 kms/ 90 kms/ 50 kms/12 kms Times – 9.30 sharp. Trip to Tipp Sunday 19 Aug 2012 Distance: 180km sign on 7.30am depart 9.00am 100km sign on 9.00am depart 10.30am 70km sign on 9.00am depart 10.30am 20KM Family fun cycle Sign On: 10.30am depart 11.30am. Sean Kelly Tour of Waterford Dungavan, Distance: 160km, 90km, 50km. Time/Sign On: 160km-8:30am. 90km – 9:30am. 50km – 10:30am.Weekly Training: Saturday at 9.30am. Sunday at 8.30am and Wednesday at 6.30pm all meet at the car park next to Kilmallock Cycles. All new cyclists are very welcome to join us enjoying cycling. New cyclists are always very welcome to join our cycling club with a membership of almost 110 members and still growing.